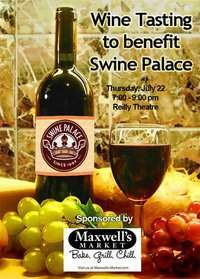 Share a summer night of fine wines and hors d'oeuvres on the Reilly Theatre stage on July 22. Sample an assortment of 16 excellent champagne and wine varietals, all while supporting Swine Palace, Baton Rouge's only professional Equity Theater company. Secure your $5 raffle ticket to win an instant Wine Cellar--25 bottles of summer's finest wine varietals. Oh, and don't forget--mystery envelopes filled with wonderful gifts provided by some of the area's finest hotels, arts organizations, restaurants, spas, and businesses will be for sale at the event. Everyone is a winner! You don't know what you will win, but you are guaranteed a great bargain. Join us for what is sure to be a memorable evening. Buy your tickets today! (Limited tickets are available). For more information, contact Jacquelyn at (225) 578-9277 or jcraddock@lsu.edu.